Gipton Fire Station opened in 1937 and closed its doors for service in 2015, having played a very significant role in the local community for 75 years. It is now a thriving community hub! In 2014, the West Yorkshire Fire Service commissioned a new fire station in Killingbeck and decommissioned their stations in Gipton and Stanks. Two locally-based community organsiations (GIPSIL and Zest Health for Life) approached Leeds Community Foundation (LCF) to see if it was possible to save the building for the community by converting it into a Community and Enterprise hub. LCF managed a significant fund set up by the late Jimi Heselden, a local businessman who was born and brought up in East Leeds. Following discussions with Jimi's family, LCF was able to make a grant from Jimbo’s Fund to finance the purchase and renovation of the former fire staion. Jimi felt passionately about supporting his local community, so this is a very appropriate way of acknowledging his tremendous generosity. Many of the original features have been retained - old pumps, the firemans poles some flooring and tiles - with the building being transformed into a bright modern hub of activity. Find out more about the history of the building and the people who worked here at https://smartgallery.org.uk/ our online museum! A space where local people can come to socialise, access support and simply relax and have fun. An opportunity for children and young people, adults and older people to maximise their potential, improve their well being and qulaity of life under one roof. An amazing venue where a wide range of different and complimentary not for profit tenant organisations can come together ond provide services, support, advice and information. 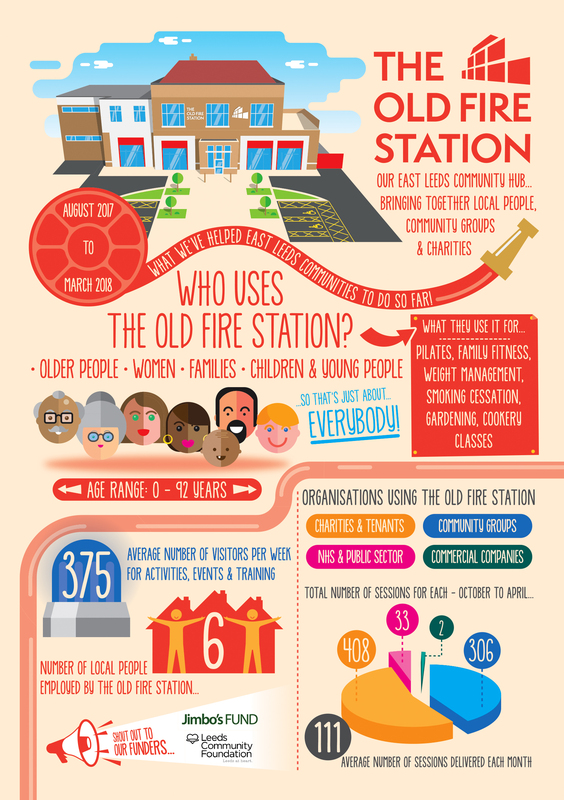 Our main aim is to ensure that The Old Fire Station is a thriving, welcoming centre in East Leeds where all are made to feel valued and safe whilst providing the opportiunity to learn, develop and engage in positive activities. If you would like to find out more about the groups involved in the project, please follow the links above, or contact the Reception Manager on 0113 213681 or info@theoldfirestationgipton.org.uk.